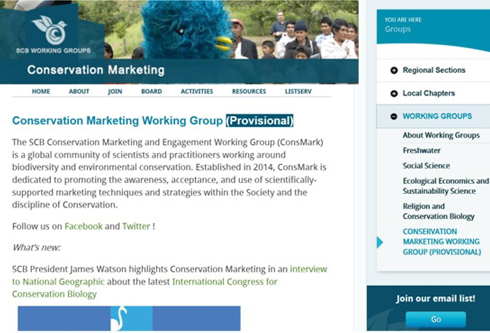 After much work the Society for Conservation Biology (SCB) has a new working group: the Conservation Marketing and Engagement Working Group! I am excited to co-chair this new community of practice and loot forward to have as broad involvement as possible from both within and outside the SCB. For those who are SCB members people do not forget to edit your profile and become official members! For those who are not members of the SCB look into our mailing list which is open to all who want to share or ask questions around conservation marketing, behavior change and biodiversity. We are now working to make this working group official! We have already fulfilled the membership requirements and are working to take care of the paperwork!